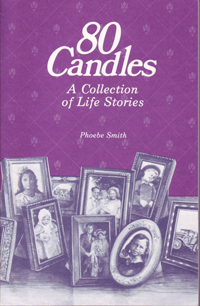 Long-time island resident Phoebe Smith is the author of 80 Candles: A Collection of Life Stories (1988), and Glimpses of Bainbridge: A Collection of Life Stories (1992). The two books celebrate the lives of members of the Bainbride Island Senior Community Center. Smith, already 80 when the first of the two collections was published, personally interviewed, transcribed the taped interviews, and put together these two remarkable oral histories. She describes the lives of the islanders featured in the books as follows: "They have lived through the same period of time: horse-and-buggy days, years of do-it-yourself hard work, the Great Depression, two world wars, and the continuing proliferation of machines. Each life, however, is unique." So, we would like to add, are these books and its author. Phoebe Smith passed away in 2006 at the age of 98.